New research underway at the University of British Columbia suggests those Olympic ski racers and aerialists preparing to hurl themselves down mountains were destined to seek out excessive speeds and massive air… they may be genetically pre-disposed to thrill-seeking behaviour. UBC PhD candidate Cynthia Thomson was encouraged to pursue her line of research when her thesis supervisor commented on her extreme weekend tendencies. What makes some people seek out adventure sports and adrenaline highs, they wondered, while others are happy hanging by the pool and firing up the barbecue? Could it be more than just personality? Could it be that we are just dopamine-junkies, trying to keep the flush of a high spurting through our neurons? 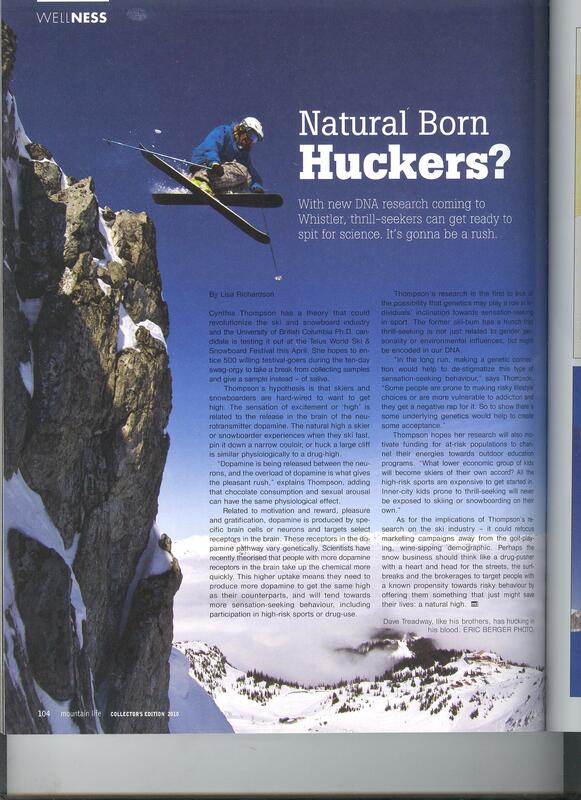 Thomson will be in Whistler at April’s TELUS World Ski and Snowboard Festival enticing avid skiers and snowboarders to spit for science, in the hopes she can establish a correlation between the thrill-seeking tendencies of riders and genetic variations in their dopamine uptake.